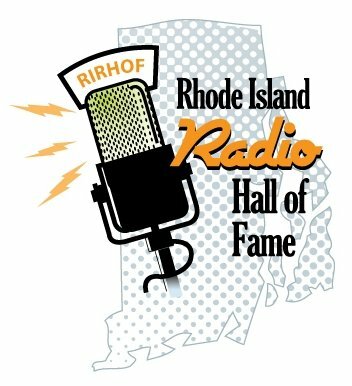 This page is dedicated to the many Rhode Islanders that traveled the world through their Radios. Sets that they either bought or built - using antennas strung from poles, trees and wood frames - listening over headphones, horn speakers or paper cones - hearing music and voices through the ether. All long- distance reception of broadcasts, and those whose imaginations have placed them in the class with world champions, now can retire from the limelight. Walter Rodman Pierce, Jr., a 17- year –old boy of Saunderstown, Rhode Island, seems to have all the other known DX artists backed completely off the boards with a record of 694 stations in 41 countries. 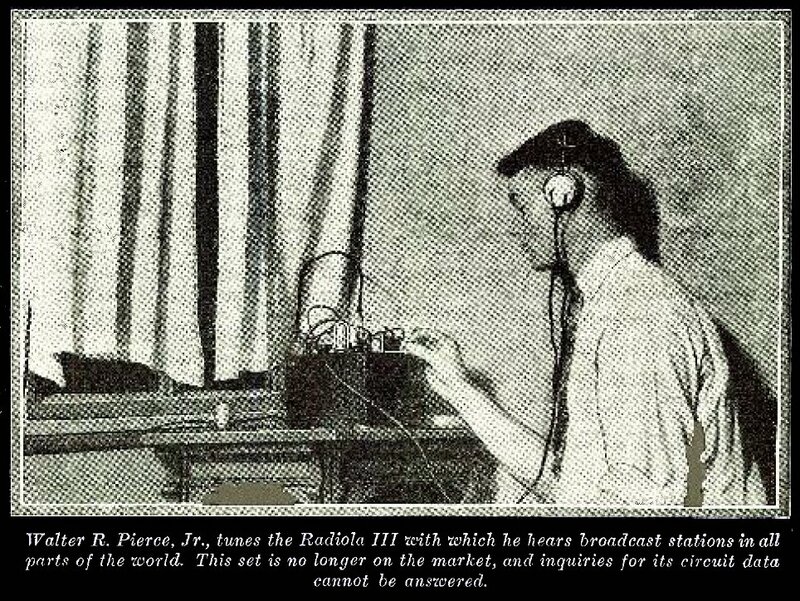 When Pierce's friend and brother "ham," Franklin B. Rowell (1AMU) of Pawtucket, told me at a recent New England convention of the American Radio Relay League that Pierce was receiving broadcasts from Japan, the Philippines, Australia and other countries in all parts of the world, on two tubes, it sounded like the result of a superheated imagination. -But Pierce appeared to be an honest young man; and he gave me from memory the call letters and locations of so many stations that he said he had logged, that I knew he must have either heard most of them many times or else spent most of his time memorizing the call books. He said that he had letters and cards from many of these stations, verifying his reception. Still, his record was so remarkable, so nearly incredible, that I decided to visit his home and see the evidence before making any unqualified statement. Several months later I visited Saunderstown. Pierce's home, I found, was a farm back in the woods. A grocer on the highway took me over in his truck. 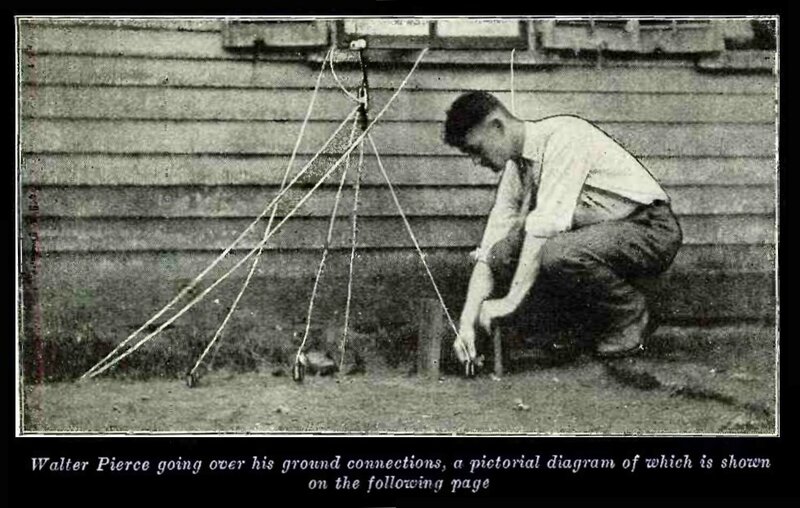 I talked Walter Pierce going over his ground connections, a pictorial diagram of which is shown on the following page with him and with members of the boys family while I waited for the boy to come home from school. The house is in a good radio location, on a hill that rises west of Narragansett Bay, opposite Newport. 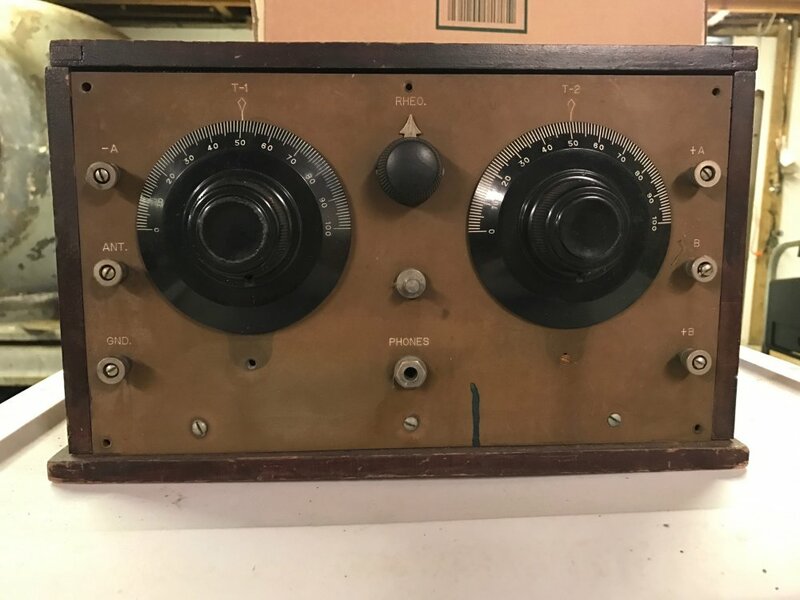 Pierce's receiver is a Radiola III, a two-tube set which was well known a few years ago, but which is now entirely off the market. 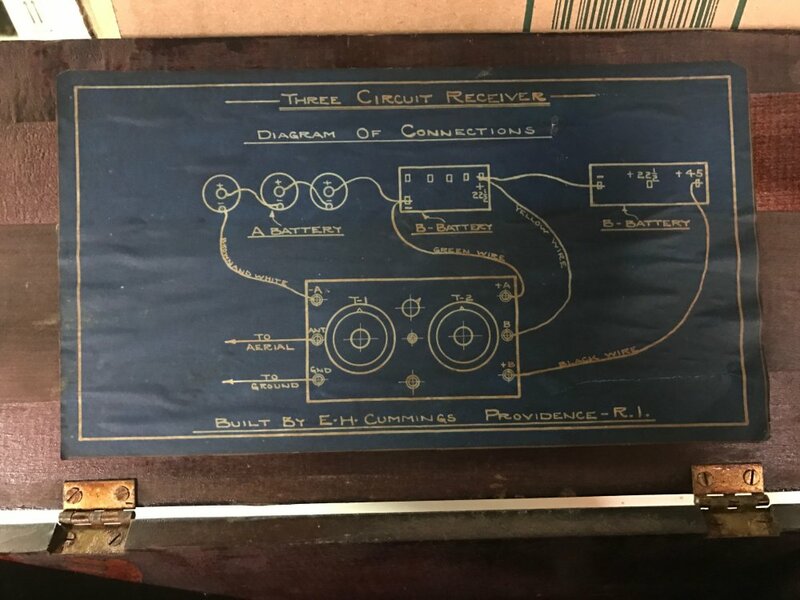 He had the little set on a table in the living room; it was hooked up to three dry cells and two 45 -volt "B" batteries. He was using tubes of the 199 type, with adapters, instead of the WD -11 type for which the set was designed. From the looks of the outfit, I would have said that New York would have been DX for it; but outside the window there was something unusual. The wire that led from the ground connection on the receiver out through the window ended at a binding post on a porcelain base. From this post twelve wires led to the same number of pipes or other pieces of metal embedded in the ground (see Fig. 1). Pierce said that he found that each new ground connection increased selectivity and reduced the effect of body capacity; so he added one after another. A leaky automobile radiator was sunk in the ground, at the end of the row of pipes, with its cap just above the surface so that water could be poured into it. Circumstances alter cases. On a car, that radiator could only have inspired profanity; here it was an ideal device for keeping the ground connections wet. The ground clamps on the pipes were bright. Pierce said that he put on new ones every few weeks. It became evident that his phenomenal record was not the result of accident. The aerial is 110 feet long and 26 feet high; it points N. N. E., with the set at the southerly end. 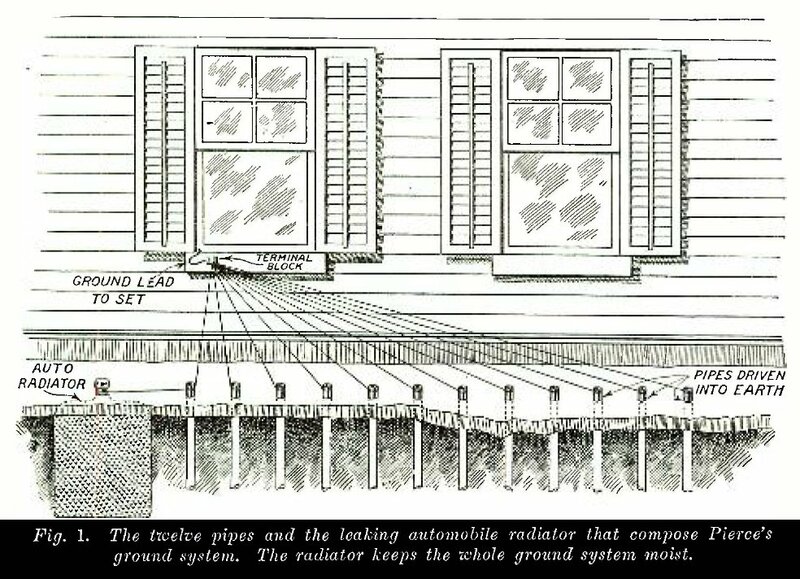 Two glass insulators in series at each end prevented the escape of energy. The wire was of bare copper which, Pierce said, gives better results than tinned copper. He puts up new wire to replace the old every few months, or as soon as corrosion becomes noticeable. The aerial is kept taut, to prevent swinging. It was still daylight, though late in the afternoon, when I sat down at the receiver. As soon as the tongue of the rheostat touched the first turn of wire, a station jumped at me. So many came in as I turned the knob that I advanced it only an eighth of the way to the maximum setting. These stations were within a radius of about 200 miles. Pierce took charge of the set and turned the rheostat knob to the maximum position. There was another rheostat at the batteries, adjusted so that it was impossible to injure the tubes by turning the one at the set too far. Almost immediately he brought in 2L0, London, England! After a night's rest, we rose at early dawn and went back to the set to listen for stations on the other side of the earth. Station 1YA, Auckland; New Zealand, was one of the first to come in. The carrier wave was strong, but the music and announcements were weak. An orchestra was playing. When it stopped, the announcement "1YA, Auckland Station," was heard. This was between 5:35 and 5:37 A.M., Eastern Standard Time, on November 1, 1927. The announcement was logged again at 5:45. A number of stations in the antipodes, including JOCK, Nagoya, and JOAK (no joke! ), Tokyo, Japan, and 2YA, Wellington, New Zealand, were recognized by their carrier waves. The average broadcast listener may doubt the ability of any person to identify stations by the sounds of their carrier waves; but some may have discovered, as Pierce did, that it can be done. For two years he has operated his set several hours a day, fishing for distant stations. He knows his dials as a navigator knows his compass. He knows the schedules of many of the broadcast stations. He can start at zero on the dial scale and tell what station he is going to bring in at each mark, and between the marks. While a station 10,000 miles away was coming in near 4 on the scale, WGY, Schenectady, was working on a wavelength very near it. Pierce separated them, and after seeing him do it, I did. His set increased its selectivity as he added extra ground wires and, as his mother says, he can "adjust the tuning lever to the sixteenth of a hair's breadth." Pierce has more convincing evidence of his achievements in world -wide broadcast reception than the testimony of a visitor. When he hears enough of a program to tell definitely whether the number was a piano solo, an orchestral selection or something else, he writes to the station to secure confirmation of the record in his log. Some of the stations are so far away that four months elapse before the reply comes back. Among the letters and cards that he showed me were some from LOX, Buenos Aires, Argentina; 4QG, Brisbane, Australia; SCL, Adelaide, Australia; KGBU, Ketchikan, Alaska; CZE, Mexico City; HHK, Port au Prince, Haiti. Several English stations answered his letters, but their replies were somewhat indefinite. 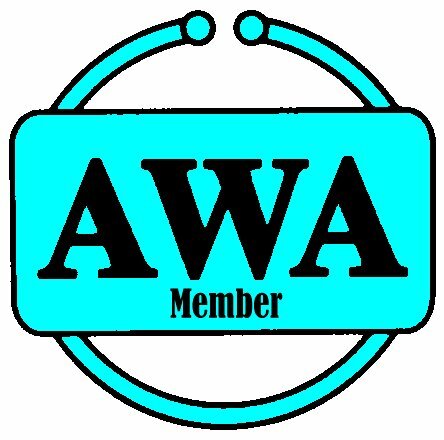 He has many verifications from stations in the United States and Canada, from coast to coast, but he considers nothing as real DX except reception from another continent or its islands. Mexico: CYX, CZE, CYJ, CZI, CYO, CYB, CYH, Mexico City; CYS, Monterey; CYY, Merida; ME, Tampico; FAM, Guadalajara; CYR, Mazatlan; CYU, Puebla; CYQ, Tampico. Cuba: PWX, 2BB, 2EP, 2HC, 21IP, 20K, 2RK, 2TW, Havana; 7SR, Central Elia; 6KW, Tuinucu (this station came in louder than any other that Pierce ever received. On Dec. 30, 1926, he thought it was going to burn out his loud speaker); 8JQ, Santiago de Cuba; 6HS, Santa Clara; 7B Y, Camaguey. Haiti: HHK, Port au Prince. Central America: AQM, San Salvador. South America: CMAC, Santiago, Chile; SQIG, Sao Paulo, Brazil; AYRE, Caracas, Venezuela; CBC, Santiago, Chile; OAX, Lima, Peru; LOX, Buenos Aires, Argentina; CMAT, Tacna, Chile; CWOZ, Montevideo, Uruguay; Pernambuco, Brazil; LOP, Buenos Aires, Argentina; LOS, Buenos Aires, Argentina; CWOR, Montevideo, Uruguay; CNA, Valparaiso, Chile; Rio Janeiro, Brazil (no call letters announced); LOY, Buenos Aires, Argentina; LOV, Buenos Aires, Argentina; CMAB, Santiago, Chile; SPE, Rio de Janeiro, Brazil; LOU, Mendoza, Argentina; LOZ, Buenos Aires, Argentina; LOR, Buenos Aires, Argentina; LOT, Buenos Aires, Argentina; CWOS, Montevideo, Uruguay. Alaska: KGBU, Ketchikan; KFQD, Anchorage Europe: 2L0, London; EAJ3, Cadiz, Spain; IMI, Milan, Italy; SPY, Plymouth, England; Skattudden, Finland; Oslo, Norway ; Berne, Switzerland; EAJ7, Madrid, Spain; SRB, Brussels, Belgium; FPTT, Paris, France; 2ZY, Manchester, England; 5SC, Glasgow, Scotland; SIT, Birmingham, England; SNO, Newcastle, England; EAJ1, Barcelona, Spain; LL, Paris, France; LA, Langenberg, Germany; 2RN, Dublin, Ireland; EAJ4, Madrid, Spain; EAJ12, Oviedo, Spain; Stuttgart, Germany; EAJ2, Madrid, Spain; EAJ22, Salamanca, Spain (this was the loudest European station heard) ; HA, Hamburg, Germany; PTT, Toulouse, France; INA, Naples, Italy; 6CK, Cork, Ireland; Copenhagen, Denmark; EAJ13, Barcelona, Spain; Bordeaux, France; EAJ25, Malaga, Spain. Africa: Senegal, West Africa; WAMG, Cape Town, South Africa; Radio Casa Blanca, Morocco. Asia: KZUY, Baguio, Philippine Islands; JOAN, Tokio, Japan; JOCK, Nagoya, Japan; JOBN, Osaka, Japan; JODK, Keijo, Japan; KZRQ, Manila, Philippine Islands; 1SE, Singapore (reception uncertain); NRC, Shanghai, China; 5í-íN, Hongkong, China; 7CA, Calcutta, India; KZRM, Manila, Philippine Islands; XOL, Tientsin, China. Australasia: 2BL, Sydney, Australia; 5CL, Adelaide, Australia; 4QG, Brisbane, Australia; 3L0,' Melbourne, Australia; 4YA, Dunedin, New Zea land; 3AR, Melbourne, Australia; 2FC, Sydney, Australia; 1YA, Auckland, New Zealand; 4RN, Rockhampton, Australia; 2KY, Sydney, Australia; 2YA, Wellington, New Zealand; 3YA, Christchurch, New Zealand; 5DN, Adelaide, Australia. Hawaii: KGU, Honolulu. 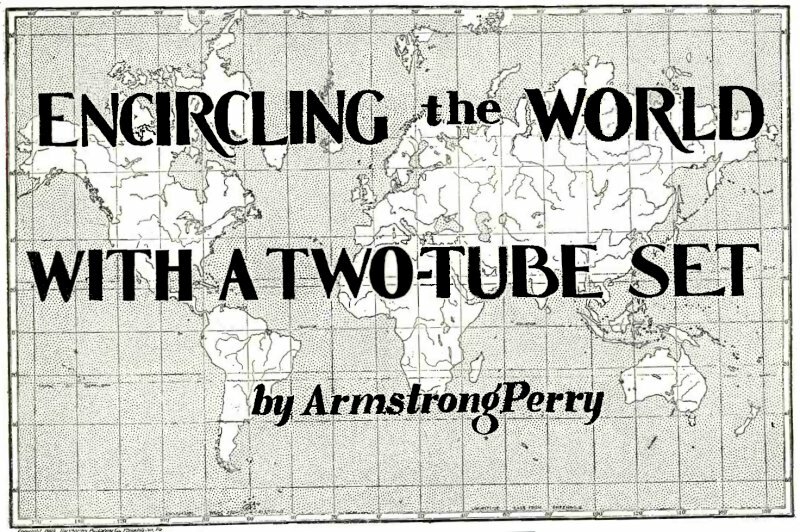 Pierce logged Australian stations every month in 1927. They and others in the antipodes came in best about 4.30 to 5 o'clock in the morning, when he had to get up to do the milking and other- chores. 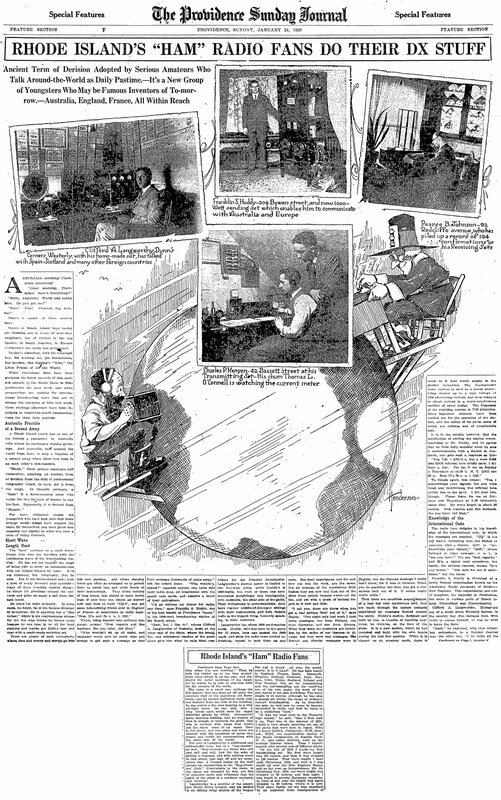 European stations were best from 4.30 to 7 P. M., and South American stations from 5 to 11 P. M.
During the evening of March 13, 1927, Pierce startled his family by loud whoops of joy. It was one of those rare nights when radio was at its best. He logged the following: KGU, Honolulu; KGBU, Alaska; AGM, San Salvador, Central America; CNAD, CMAT and CMAB in Chile; LOX, LOZ, LOV, LOP and LOY in Argentina; EAJ22, Spain; SQLG, Brazil; Rio de Janeiro, Brazil (no call letters announced) ; CWOZ, Uruguay; OAX, Peru; Durban, South Africa; CYR and CYU in Mexico and PWX, Havana. 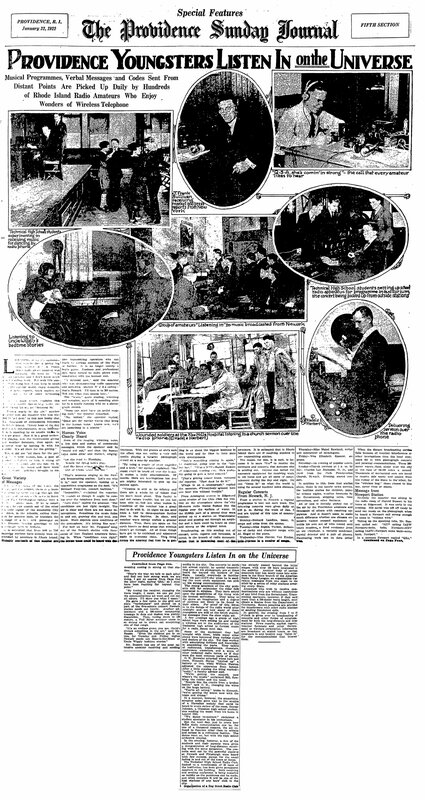 Pacific coast stations in the United States came in almost as easily as those near home. Unidentified foreign stations came in on 345, 288 and 307 meters. Pierce's radio log, kept with painstaking care for two years, will convince anyone who examines it that it is an authentic record. Many of his records are verified by letters or cards from the stations heard. And there is other evidence almost as strong, or perhaps stronger. At first, about the only thing radio offered the Roaring Twenties was the roar of static. That began to change as stations across the nation began broadcasting. 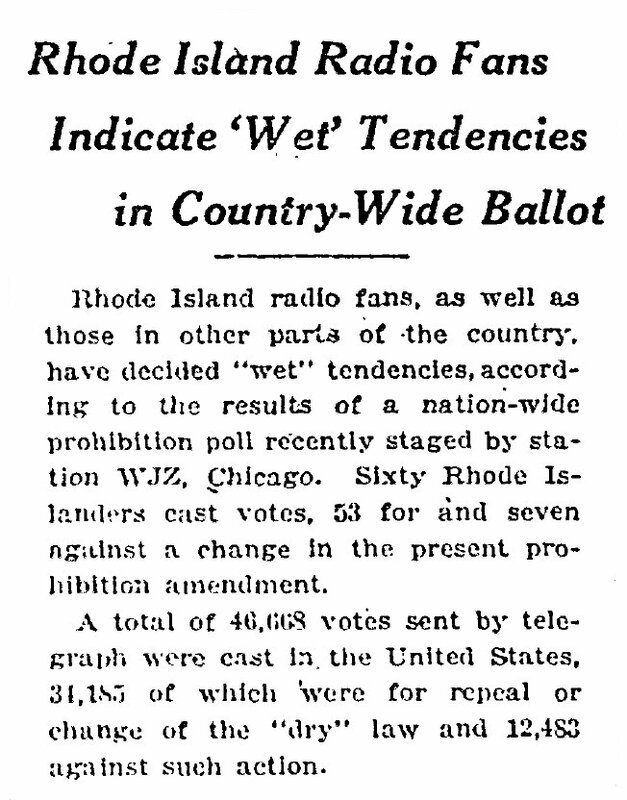 Among the early arrivals: two radio stations in Rhode Island, WEAN and WJAR, both of which went on the air within months of each other in 1922. 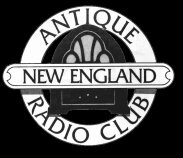 Among the first thing they did was advertise radios for local department stores, according to Linda Eppich, chief curator at the Rhode Island Historical Society. The premise was simple: If you want to sell radios, give people something to listen to. 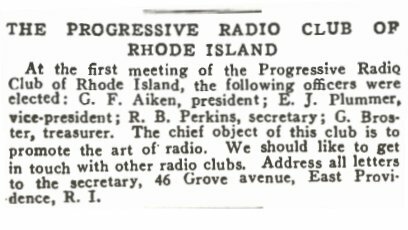 "These three stations, including WPRO (which opened in 1926) were owned by retail stores who bought them for the sole purpose of selling the new radios," Eppich said. Within a few years, radio was sweeping the nation, offering people an even more immediate connection with the rest of the world than they could get from movies or reading a newspaper. In Hollywood, film studios cranked out silent movies and a star named Rudolph Valentino emerged as the Leo DiCaprio of the day. 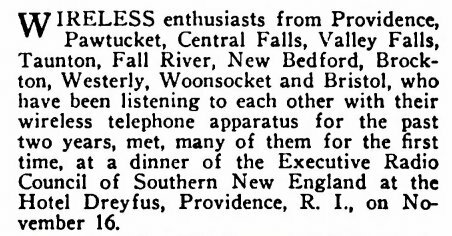 Telephones were appearing in most every household, but as the decade began, only a handful of people in America had a radio, and it was usually a primitive crystal-tuned affair that required headphones and a lot of patience. 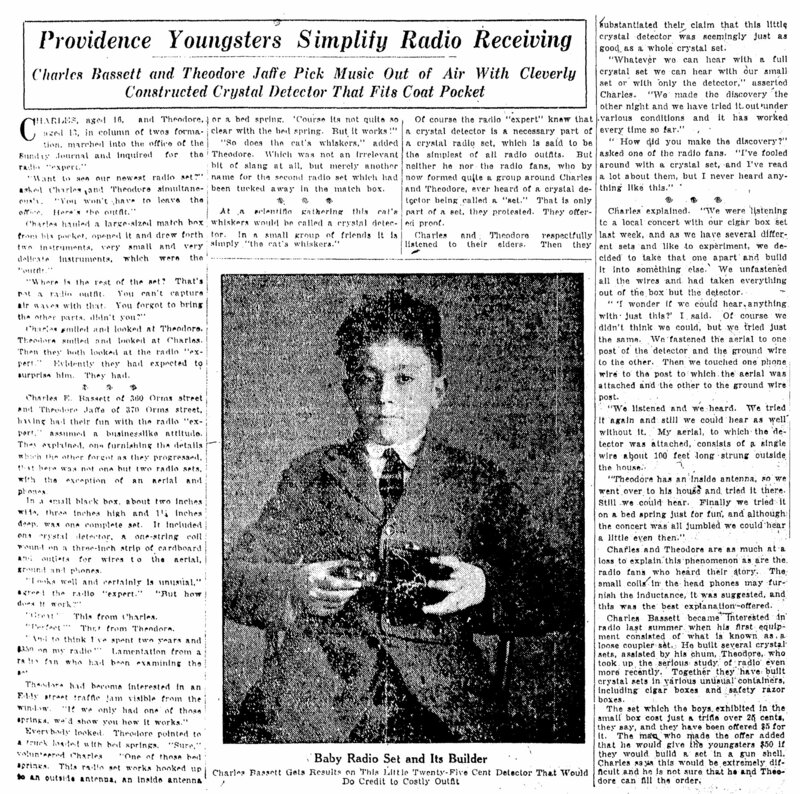 By the time Charles Lindbergh crossed the Atlantic in May 1927, radio was a staple of the American news diet, and was rapidly becoming more than an ad venue for local stores. Stations by then were broadcasting live music, although they would not be allowed to play recorded music until the mid-30s (at the instigation of a young crooner named Bing Crosby). And they were fighting each other to be the first with news headlines and updates. From the start, Eppich said, Rhode Island was among the leaders in embracing the technology. "For a small state we had so many stations early," Eppich said. "We think of New Jersey and New York being the biggest, and here's a state that had less than half a million people in 1922 and we had four stations." 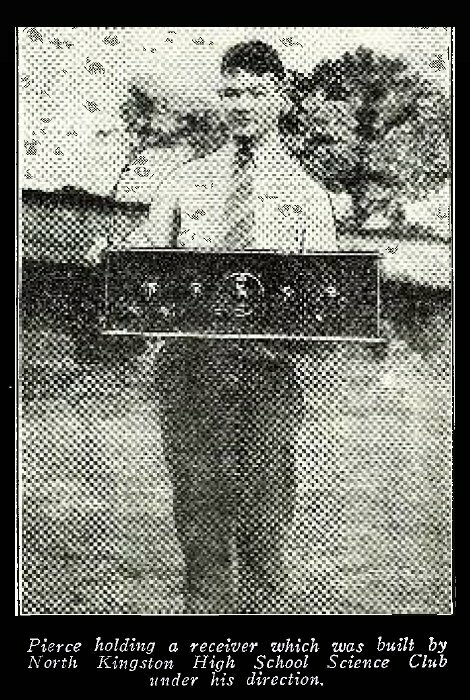 As the decade rolled on, Rhode Islanders found more powerful radios on store shelves, Eppich said, including a line of radios made by the Royal Radio Company, in Providence. It was called a "Polle Royal." 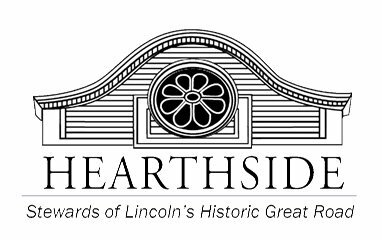 To listen in, you had to plug in earphones, and it helped to live close to the station, which was often set up in quarters on top of the department store that financed it, Eppich said. 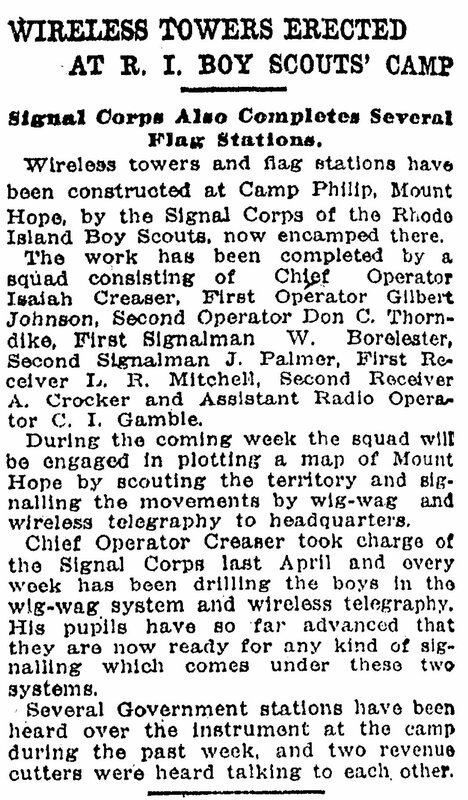 Then came the networks, with WJAR the first to join up. After only a year or so in operation, it became a network affiliate of NBC. That move, mirrored elsewhere in the nation, would lead to the explosion in radio broadcasting that took place in the 1930s, when radio boosted the popularity of Big Band music and allowed a man few people had heard of in 1929 to make the medium his own with what would be known as Fireside Chats. 1-WP AN EARLY WIRELESS RECEIVER. 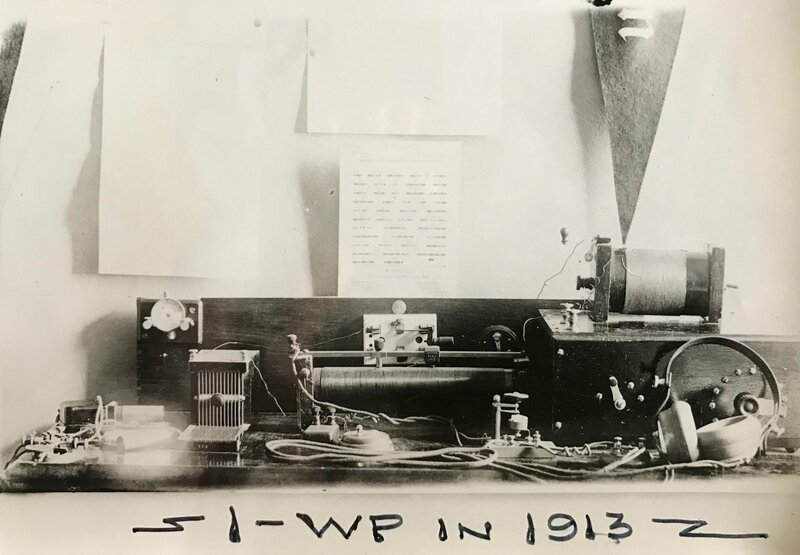 With this set-up, which was part of amateur station 1 -WP, Warwick, RI, circa 1913. the operator was able to log stations from Maine to Florida. 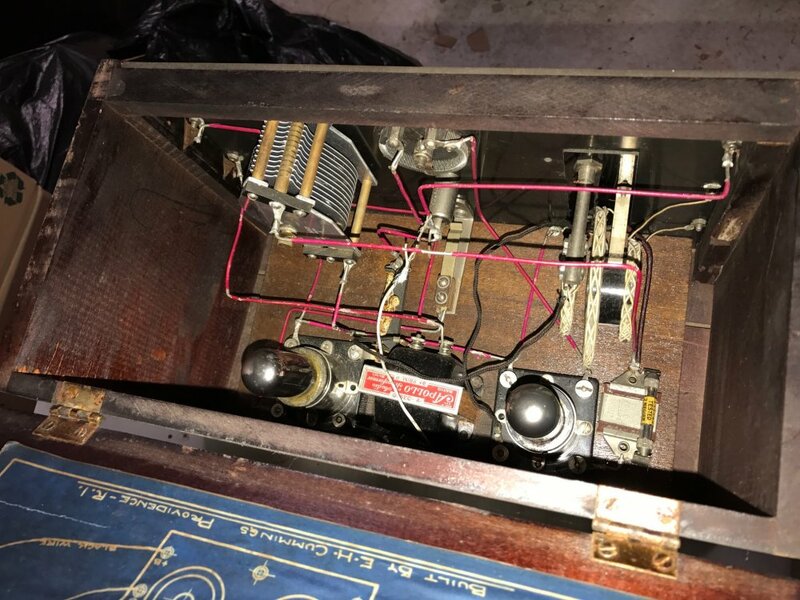 Note the variable -contact catwhisker crystal detector, 23 -plate tuning capacitor, and double -slide -tuned coil. Found at the New England Wireless and Steam Museum during weekly clean up and organization. Alonzo R Williams was another Rhode Island DXer6 that took his other hobby Meteorology and did a personal study of the effects of weather, in particular barometric pressure, on radio reception. 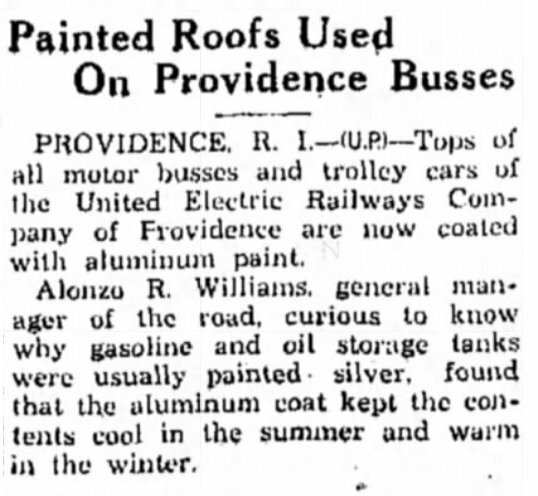 The following article was posted in the Providence Journal on May 9th, 1926. 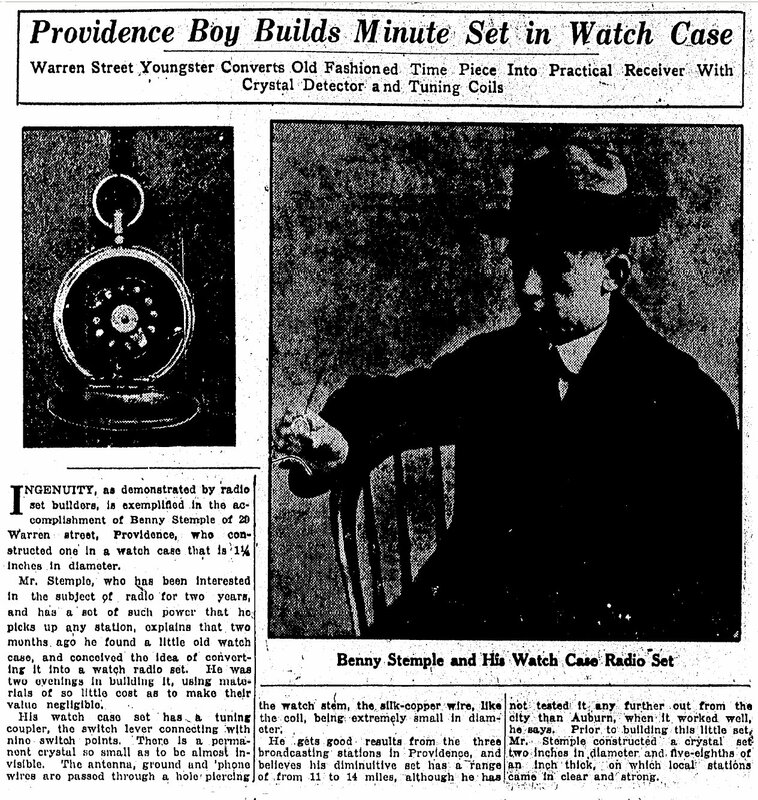 Barometric pressure, not temperature of magnetic blankets, is the controlling factor in clarity of radio reception, according to Alonzo R Williams of 102 Meeting Street Providence, who has made available to the Providence Journal the results of a painstaking analysis of conditions affecting radio reception during the past two years. Mr. Williams has carefully charted the results of his investigations. 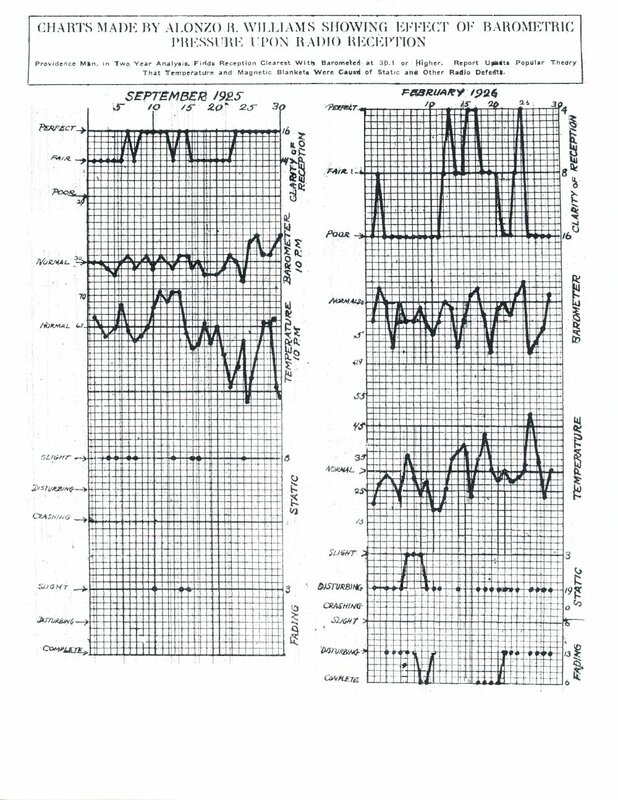 The Journal presents herewith a chart covering two months of the two-year period over which Mr. Williams carried on his investigation. They are typical months, showing good reception in September, 1927 and exceedingly poor reception in February of this year. The poor reception during the cold weather of this winter was the circumstance that upset the calculations of radio engineers all over the country, the supposition having heretofore been held that cold weather was favorable to radio transmission and hot weather unfavorable. Mr. Williams presents an entirely new theory to the radio world in his contention that barometric pressure and nor temperature is the controlling factor. Mr. Williams article in full follows. As a result of careful records and painstakingly analysis I have evolved what to me seems to be the real solution and gladly “let the rest of the world in on the secret” through the columns of the Providence, Journal. The set which I use is a one-tube reflex with crystal detector with which 133 DX stations have been logged. The reception referred to in this article is of DX only and does not include local stations and, for the most past, limited to hours when local stations are off the air. With one station only on the air a wave trap was used. Reception, static and fading referred to herein are divided into three stages to wit: RECPETION (1) Perfect, (2) Fair, (3) Poor. STATIC (1) Slight, (2) Disturbing, (3) Crashing. FADING (1) Slight, (2) Disturbing, (3) Complete. RECEPTION is perfect where stations ae heard clearly, with good volume and no disturbing influences at work. The set in fact seems alive with varied programmes. It is FAIR when a fairly good number of stations can be heard, interfered with somewhat by static and fading when the signal strength is nor what it should be. It is POOR when few if any stations can be located, only the whistle detector of when the reception is so distorted that one much switch off the current to reserve peace of mine and quiet at home. STATIC is slight, when a faint disturbance is noted which in no way interferes with clarity or volume. It is DISTURBING when its volume is such that it disrupts programmes at times. It is CRASHING when it blots out reception by thunderous nags and continuous crackling and sputtering’s. FADING is slight when a slight variation in volume is noted, disturbing then the volume surges back an forth or remains weak for a while and then returns to strength; it is complete when the station disappears entirely for long periods and does not return to strength sufficiently long to make listening worthwhile. The records which I faithfully keep are: Temperature readings, 7 a.m. and 10 p.m.; barometer readings, 7 a.m. and 10 p.m.; character of reception, time station is heard and it’s dial readings, and degree of static and fading. All these have been charted from September, 1925 to May, 1926 and from this chart the following is perfectly apparent that BATOMETRIC PRESSURE CONTROLC CLARITY OF RADIO RECEPTION. The barometer has been below 30.05 for the greater part of the time, that is to say, below normal. The rise and fall of the barometer had been extreme, rapid and almost constant. It has seldom remained steady at any point. With a rise in the barometer to 29.9 or below, there comes fair to poor reception with static and fading. With a rise in the barometer to 30.1 and above, there comes perfect reception with a disappearance of static and fading. With the barometer above 30.1 there will be perfect reception, but if there is a sudden drop in progress at the time or a very sudden rise, there will be more or less static noted. If reception is poor with a “high” it is absolutely certain that a fall well below normal is in immediate progress. With the barometer below 29.9 or even below 39.05 there will be static and fading more or less. The lower the barometer is below 30.05 the poorer is the reception and the greater is the static and fading and this applies to any degree rapidity of fall or rise If below 30.05 providing the rise does not go higher than 30.05. If fair reception is noted with a “low” barometer it is certain that a rise to above 30.05 is in immediate progress. The above holds true irrespective of temperature for I have noted wonderful reception with the temperature extremely high for the period of the year but the barometer reading was also high and the ride in temperature was rapid. Temperature changes do not affect reception. The “clear and cold” theory for good reception does not hold true if the barometer is below 30.05. Electricity discharged in the air such as thunder storms and the like will cause static of marked degree but if the barometer is carefully noted it will be found to be rapidly falling. Every fan will admit that during the winter 1924-1935 the reception exceptionally good. To further test this theory I examined my records for that period carefully and found that during most of the winter the barometer was well above 30.05 and as high as 30.8 with a few rapid changes but when there were rapid falls below 29.9 the reception became poor and static and fading increased. I reason out this theory thusly. HIGH PRESSURE means that the direction of our upper atmosphere is downward the earth to take the place of the warm lower strata which is moving upward. In other words the atmospheric pressure is down into the open end of a barometer tube forcing the fluid there in upward in the other tube and registering “high” in the tube. I am no scientist so the following may seem absurd to a second Steinmetz but whatever such a one may say it does seem to me that whatever tends to keep the electromagnetic waves of transmission near mother earth the ore of them will be received on mother earth. No matter what the scientific reason may be it just happens, that’s all. Of course if that high pressure downward is very rapid movement, I opine, must of necessity distort signals passing through the disturbed area. That happens, too, whatever the reason. Throw a stone into a quiet mill pong and see the wavelets go out in all directions. 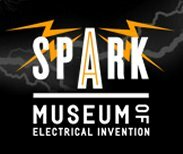 In radio the spark is the stone, the wavelets are the same. Throw a stone into a mill pond disturbed by a high wind. Your little wavelets will still go out in all directions but oh how they do bob up and down and as far as you can determine do not get very far. As you can determine do not get very far. As for static it is grounded out unless the change is rapid. I may be wrong in my so called scientific reasoning but what of it if it works? LOW PRESSURE means that the low lying warm strata is in upward movement away from the earth. 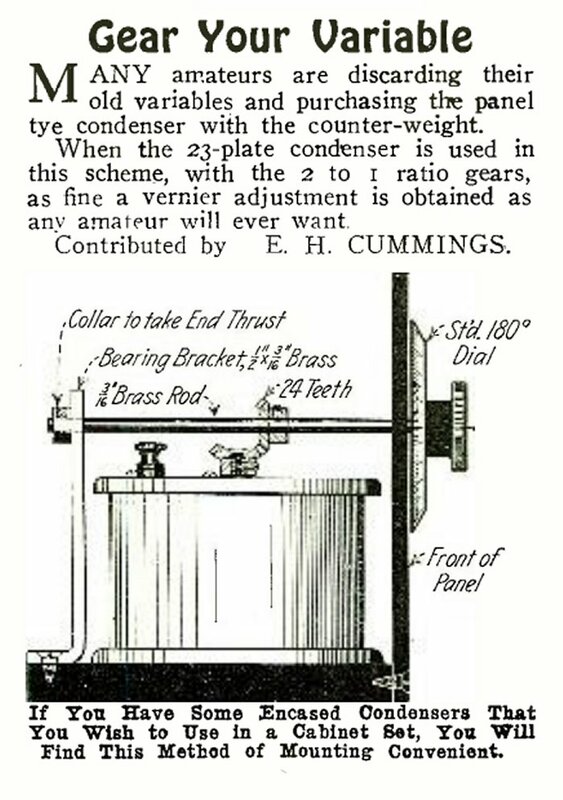 The pressure is released from the barometer tube which allows the fluid in the other tube to fall and register “low”. The atmospheric trend here is up and away from the earth and so, I opine, that the more that goes away from us the less we have. In this “upward and away” trend it seems to me that a part at least of the electro-magnetic waves go in the same direction or are influenced in that direction. The fading is due to undulating waves upward and the static is not grounded out. A glance at the September chart will reveal the fact that there were no sudden barometric changes during that month and that the needle pointed to a reading steadily around normal and above and consequently the most perfect reception of the whole 8 months and with less static and fading that in any other month. A glance at the February chart will show barometer reading below normal practically the whole month with rapid “rises” and “falls” mostly will still below normal and, consequently, poor reception with static and fading. In neither month do temperature changes affect the result in spite of the old theory that “clear cold night” are the best. Another peculiarity worth mentioning here is that then the pressure is “low” and below normal it is impossible to “cut out” a local station with a trap whereas when the pressure is “high” the trap “chops out” the local station completely and DX comes through beautifully. This phenomenon I cannot explain. I can almost predict a change by the action of the trap. Of course the static referred to hereon is not so great as that experienced with a tube detector almost by which it is amplified so this must be borne in mind in testing out of theory. 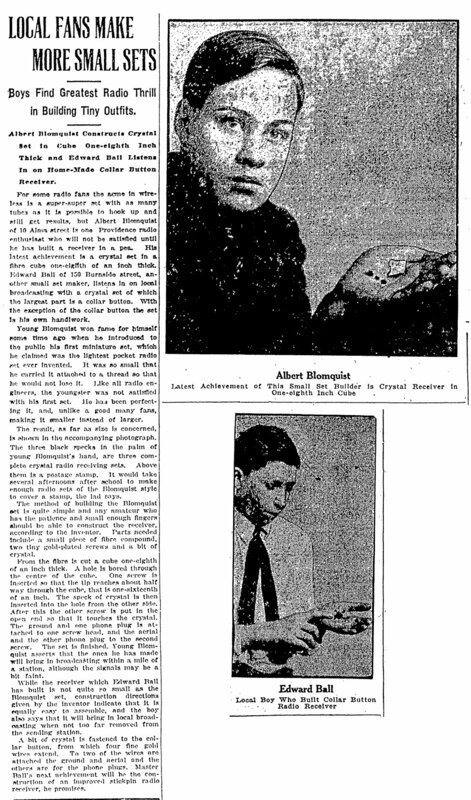 According to Robert Mack in the Providence Journal writing from Washington under date of February 16, radio engineers believed as “magnetic blanket” existed which had been lifted. As a matter of fact the poor reception still continued. He writes further “Magnetic blanket”, it is said, may not be the work for it, but in the absence of any definite knowledge of the phenomena that had troubled radio listeners for six weeks it will serve as well as any other phase. Not having heard or read of the possibility of barometric pressure having an effect on radio reception, I offer this theory to those who ae interested, including the above referred engineers for their consideration and check, hoping that it may in some way explain the conditions experienced this whole winter long and even now, and as an aide to prophecies in the future. 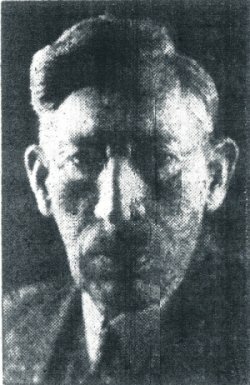 Alonzo was born October 20th, 1877 1 and died March 14th, 1948 at age 70. He was also a direct decendent of Roger Williams, founder of Rhode Island. 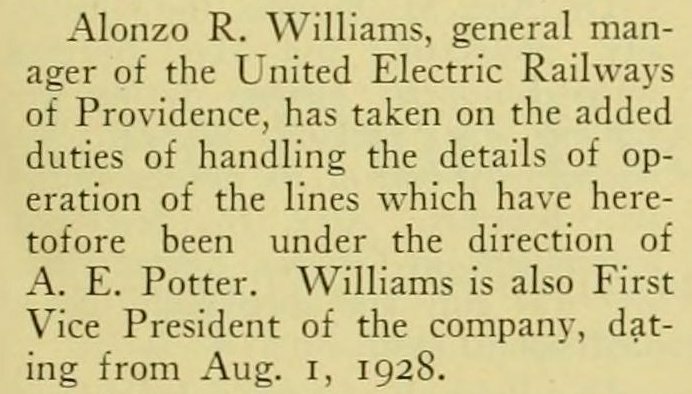 2 On April 13, 1902, Mr. Williams married the former Mary Butler. They had one son, Alonzo Butler Williams. He also had three grand-children and a sister, Mrs. Robert Vose of Brookline, Mass 6. Alonzo was in the class of 1900 at Brown University and even then he was interested in meteorology 3. 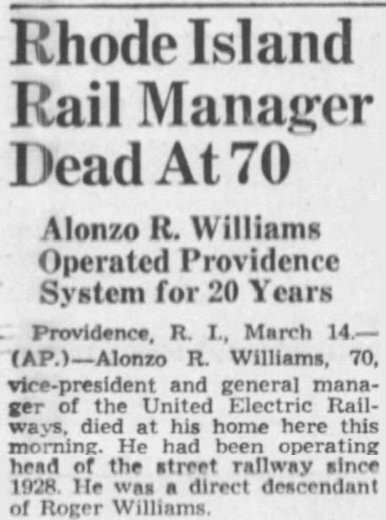 Alonzo was also the general manager of the United Elevtric Railways of Providence and was the First Vice President of the company dating back from August 1st, 1928 4. Alonzo again dabbled in weather when it came to keeping the busses and trolly cars cool in the Summer and warm in the Winter 5.